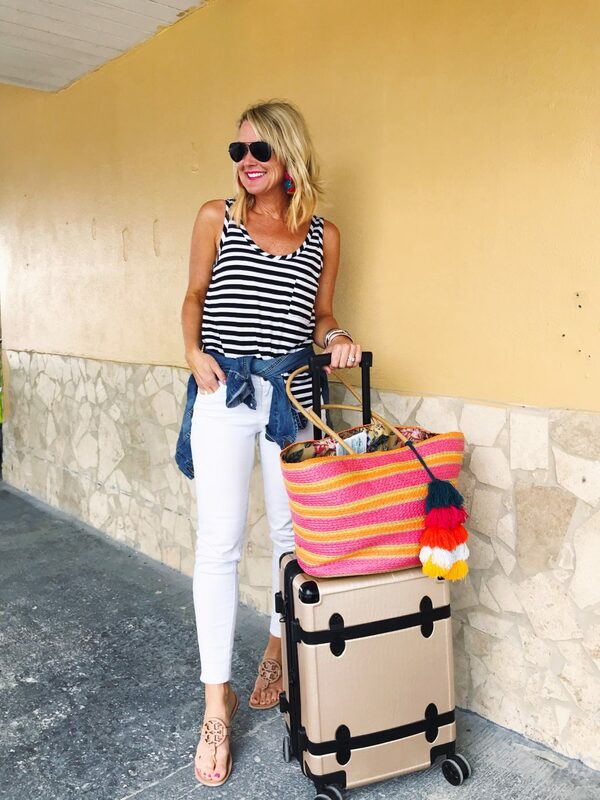 What I Packed & Wore in the Bahamas | hi Sugarplum! Happy Friday, friends, and cheers to the weekend!! 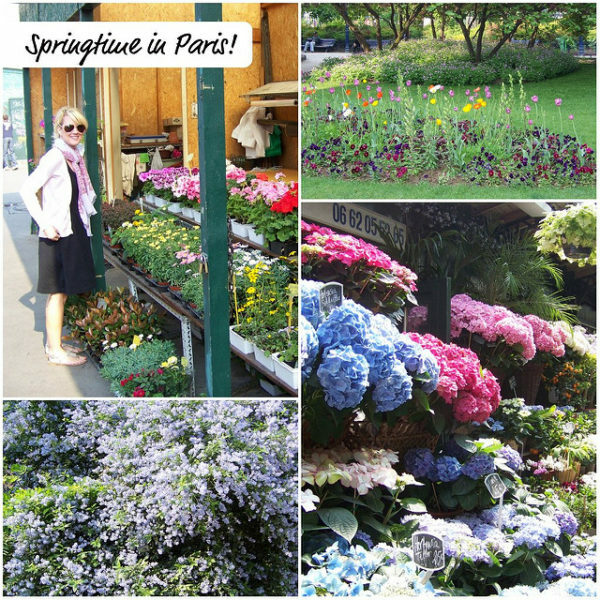 I hope you had a great week, and the first day of Spring treated you well! We’re having some gorgeous weather, but it’s too soon to know if it’s here to stay! We’ve got another full weekend of volleyball with Little Miss, so you’ll find us cheering court-side. I actually wear my beloved Sleep Buds in the gym to dull the constant whistle-blowing! Does that make me old or clever? Maybe don’t answer that. Thanks for the love on this week’s exciting announcement about the restock of Resort Collection, along with our Day in Tulum. I was thrilled so many of you loved the affordable beach finds for the family, and am excited to bring you more of those. I also shared my Sugarplum Top Five Faves, in case you missed it. Today we’re headed back to the beach…in photos anyway! 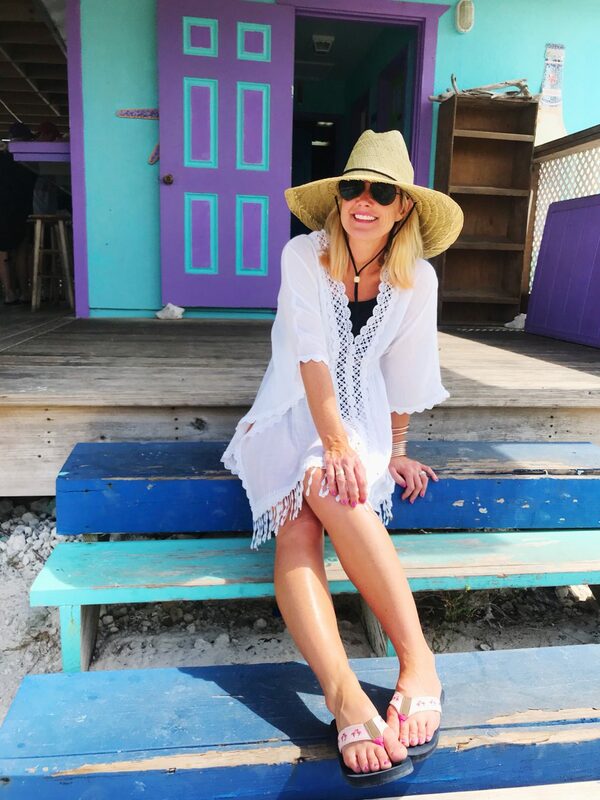 I’ll be sharing a full Trip Report of our time in Exuma, Bahamas, but first wanted to share all the outfits I packed and wore. Starting with my easy travel style…jeans and a tank, and always the jean jacket (it was chilly when we left Dallas)! 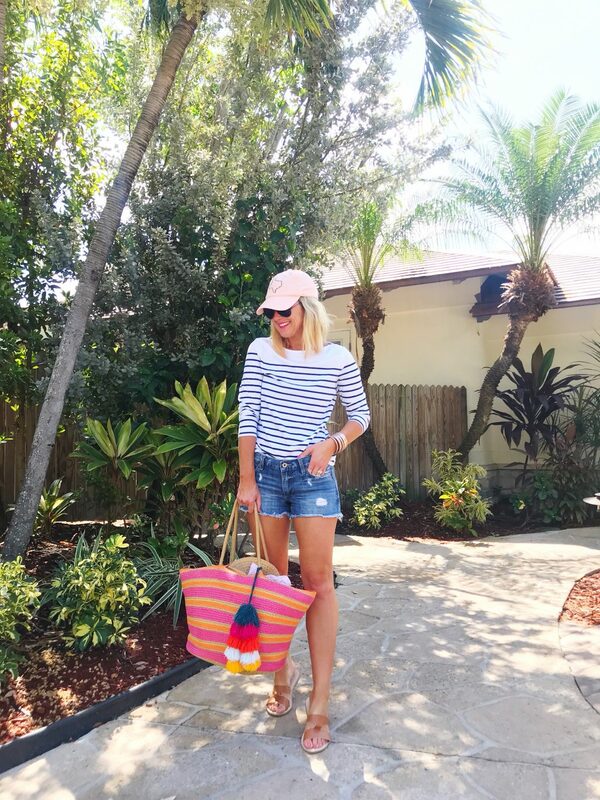 You may recognize my striped tote from yesterday’s post…such a great find for $20! It was perfect for the pool and beach, and a great carry-on, as well. Funny enough, my earrings were the star of the trip…I had more people comment on them than anything else. 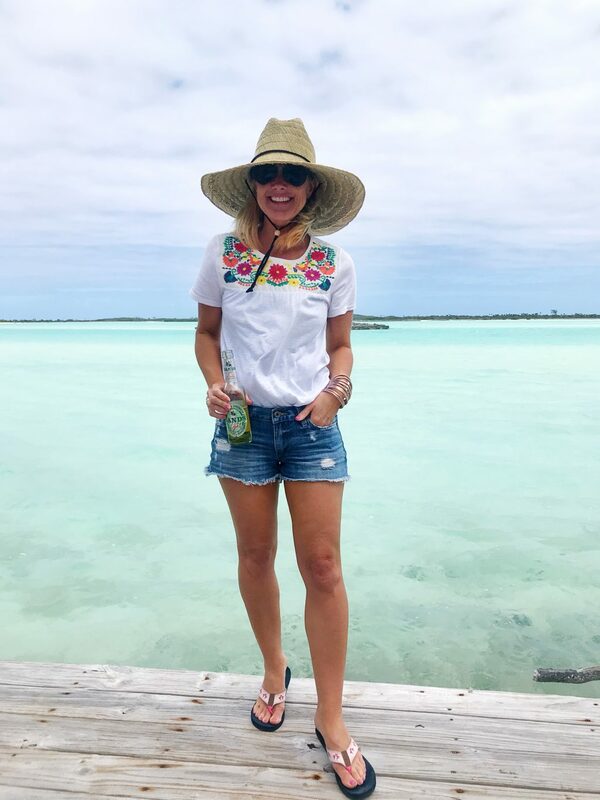 Exuma is very casual, so my wardrobe consisted mostly of swimsuits, cut-offs and tees. Most of my swimsuits are under $30 or 30% off!! 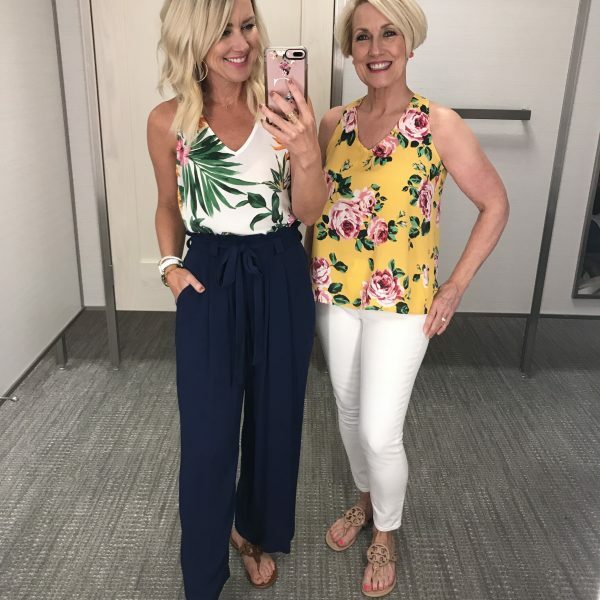 This ruffle trim suit has been a favorite for a couple of years…I love the support of the top, and full coverage of the bottoms. Plus, the ruffles and colors are just cute! Fit Tip: I always size up one in swimsuits, this is a small. And 30% off! I can’t tell you how amazing it feels to wear styles I helped design! 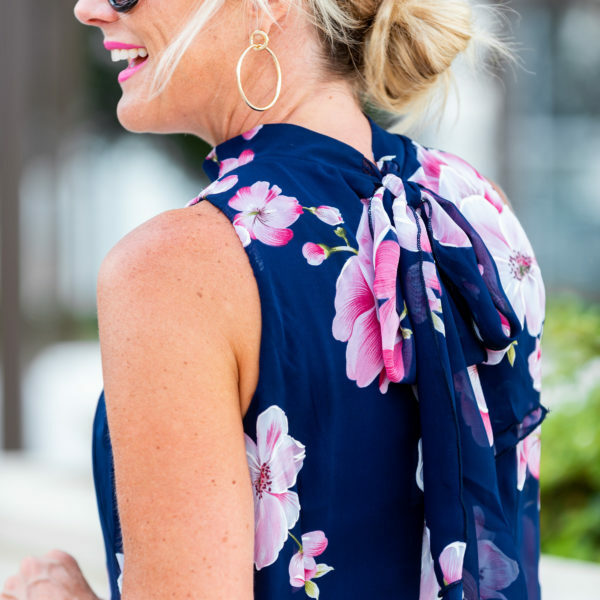 This top is as perfect on vacation as I’d hoped…so soft and lightweight, and easily works for day or night. Statement earrings are outfit-makers in my opinion, and don’t take any room in a suitcase. Just blending in with my surroundings! This crewneck is a great mid-weight cotton, and so soft. It comes in tons of great colors, which is perfect since it’s 3 for $30! Fit Tip: I sized up to a small for a more relaxed fit. Swimsuits don’t take up much space in a suitcase either, so I brought a lot! 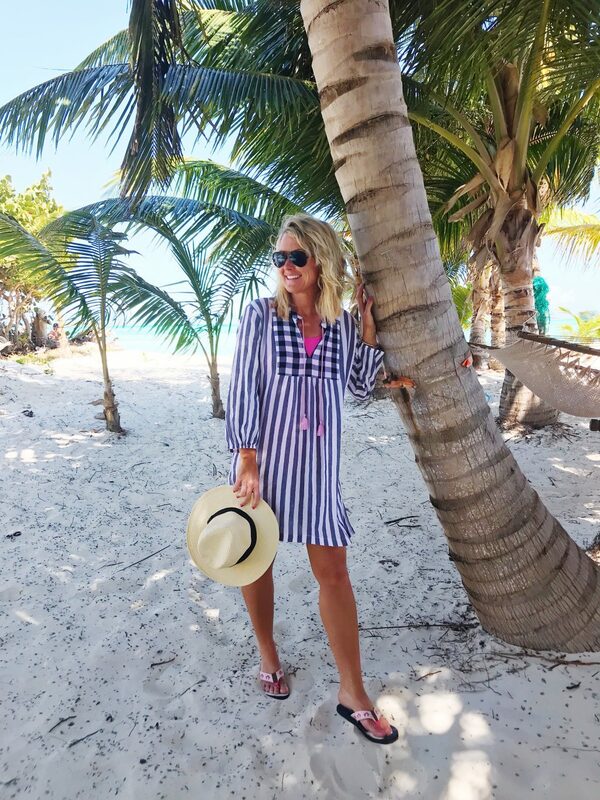 This colorblocked one piece is a favorite from our Mexico trip (see it here)…such a flattering and comfortable fit, but just a little cheeky (still family-friendly though). Remember this fun shorts set from last week’s Amazon Fashion Finds? Crazy cute for vacation, right?! Fit Tip: I’m wearing a small, size up one. Another day, another swimsuit. I actually packed this tank suit in two colors…it’s great for being active on the beach and in the water. Everything stays fully-covered and in place. It’s also cute worn as a tank top with shorts, skirts and pants. (See an example here). Fit Tip: I sized up one, I’m wearing a 4. It’s 30% off! Can you believe the water? It was literally as clear as a swimming pool, and bluer than the sky. My embroidered tee is super soft and relaxed through the body for an easy fit. Fit Tip: I’m wearing XS top and size 26 shorts. How I feel about a mile-long sandbar in the middle of the ocean. And this suit! Definitely one of my favorites…it’s like the Sisterhood of Traveling Swimsuit…it looks amazing on so many body types! A rainy morning meant extra pj time. These are my latest Amazon find, and come in a ton of patterns. Fit Tip: I sized up to a small, they did shrink a little in the washer/dryer. There’s the tank suit again…this time in black. You honestly can’t go wrong with this timeless, chic suit. It’s fully-lined with a shelf bra, but no padding. Fit Tip: I’m wearing a size 4. It’s 30% off, too! I felt like such a rebel wearing this halter dress in the new brown dot before it was available…but you can grab it now! (See all the new colors and prints available here.) 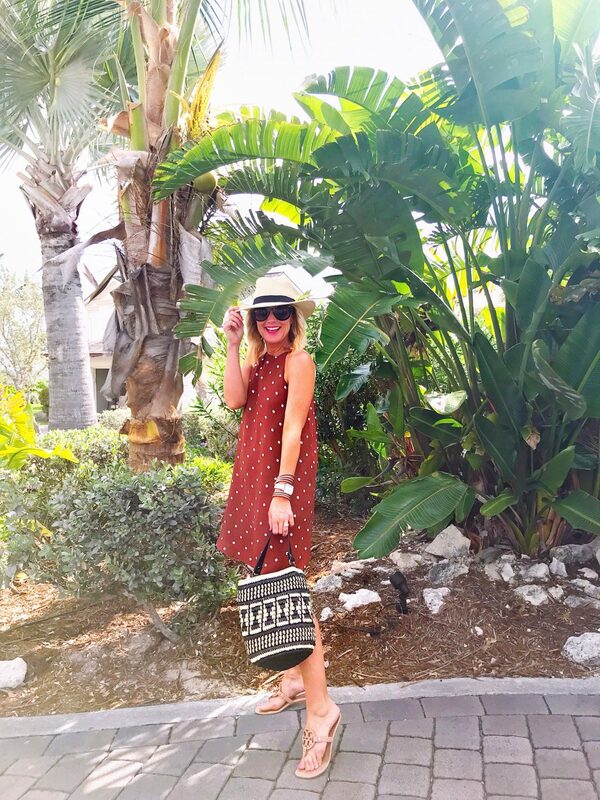 It’s the perfect dress for so many occasions, including breezy beachside lunches and dinners. You may be looking at the colorful door and cute (under $20!) coverup…but all I remember from this pic was the best meal of our trip!! This beachside shack has a world-class chef (no joke), and the food was AH-MAZING! More details coming in my full Trip Report. Fit Tip: The coverup is one-size, and comes in a ton of colors. Stripes and palms…both around me and on my ears. 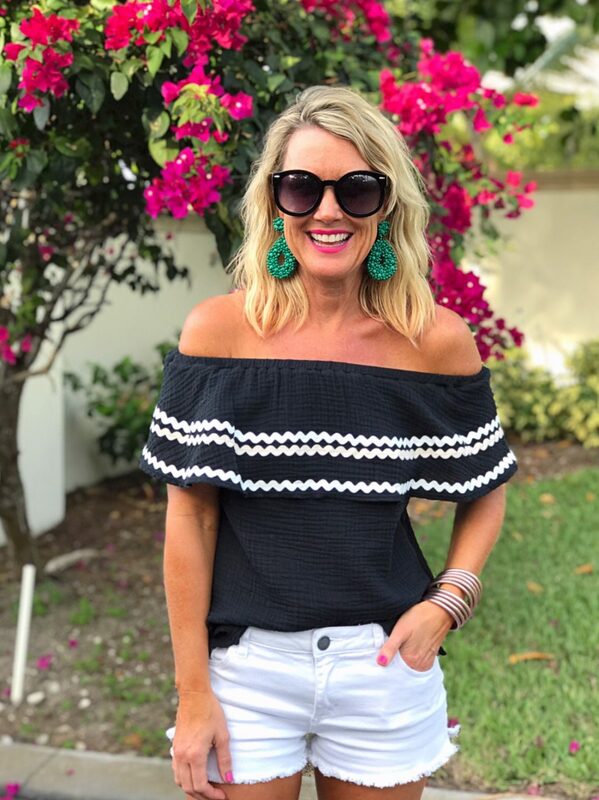 These palm earrings are such a fun statement for a steal (also from my latest Amazon Fashion Finds!). I love these pull-on shorts from our Resort Collection, and can’t wait to reveal the new colors and prints next month! Fit Tip: I’m wearing XS in both the tank and shorts. For someone who didn’t own a one piece swimsuit two years ago, I’ve certainly got quite a few now! Once I found the right fit for my frame, I realized how flattering they can be. This mixed stripe is constantly selling out, and I can see why. The ruffle placement gives the illusion of longer legs, and the ruffle trim and contrasting stripes are so fun. Fit Tip: I’m wearing a 4. Fit Tip: I’m wearing small shirt, size 26 shorts, and the sandals are true to size. This swim cover is gauzy light, and a cute mix of gingham and stripes. Fit Tip: I sized up one to a small for more room. Sadly we couldn’t stay forever, so it was back to my travel uniform for the flights home. The straw bag held up really well by the pool, on a boat, in the sand, and even through two long travel days. But again, it was my fun earrings that stole the show (seriously, almost every local woman commented on them!). Fit Tip: I’m wearing an XS tank, size 2 jeans & XS jean jacket. Did you notice the same bangles and oversized sunglasses in most every pic? Yep, the same ones from yesterday’s Sugarplum Top Five Faves…they both really are that good! What beach or tropical trips do you have planned for this year? I can’t tell you how much time I’ve spent looking at rental homes on this island since we got back…I loved it so much! I’m working on a full Trip Report with details on the travel, hotel, restaurants, swimming with the pigs, etc…are there any specific questions you want to make sure I address? I hope this post inspired your own packing! Happy weekend, lovebugs! This post makes me want SUMMER!!!! When you do the trip write up, could you mention: whether a passport was all you needed or if you also needed a visa? And what airline got you to that beautiful island? How many plane changes did you have to do? How did you get around the island? Golf carts? taxis? a rental car? or just by foot and stayed within the area? Did you do any snorkeling? If yes, did you bring your own gear or rent it? I’ve never heard of this beautiful island but I’m so glad you’re introducing it to me!!! You got it!! All great questions! I would love to know where you stayed and the above questions as well! You fit all that in that little suitcase? I mean I know you use packing cubes but are they magic?? LOL. You looked amazing and I am a wee jealous! YES!! And my hat!!! Those packing cubes are amazing…I had clothes in one, swim/undies/pajamas in another, toiletries, sandals and hat…all in my carry-on! Can you share how you get such a great tan? Do you do it yourself or go somewhere? Your outfits are precious. The earrings are on my list to get right away. Hi Allison!! I get a professional all-over spray tan when I’m going on vacation and swimsuits are part of the equation! If it’s just around town, I apply self-tanner myself! 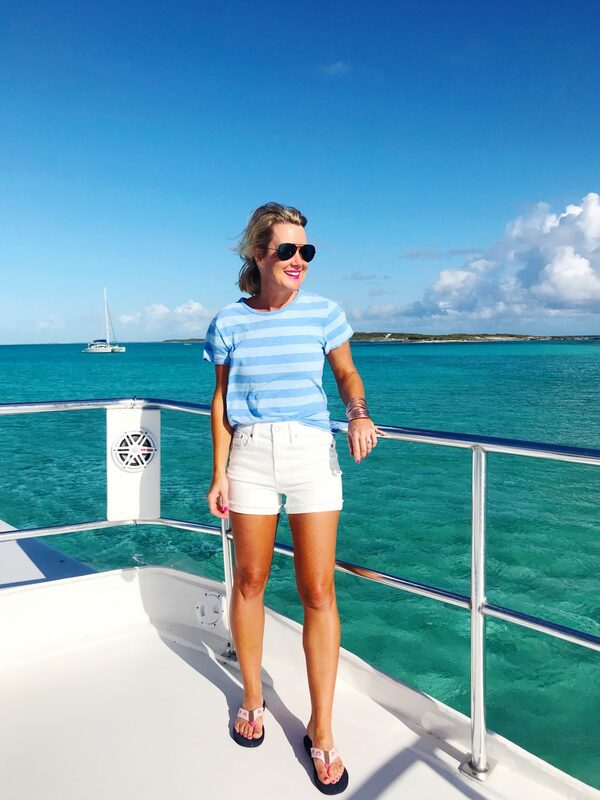 I got a little behind in my blog reading and realized we were both in Exuma at the same time! We took our daughter and her boyfriend to sandals for a week to celebrate college graduation And our anniversary,and had a blast. Can’t wait to see your thoughts on the island. We missed swimming with the pigs but our favorite was riding ATVs around the island and the golf course. How fun!!! I’m so glad y’all had a great trip! I’m already scheming ways to get back to the island! All of your outfits are adorable! Have you ever done a “How To” for packing all your clothes, shoes, accessories etc in the cubes? thank you! I have a little video under my packing tips tab, but I think I need to do a more detailed post!! Hi Cassie, Thank you so much for helping me get my style back. I finally feel good about me self again! Love seeing the outfits you put together. You are such an inspiration to us all. 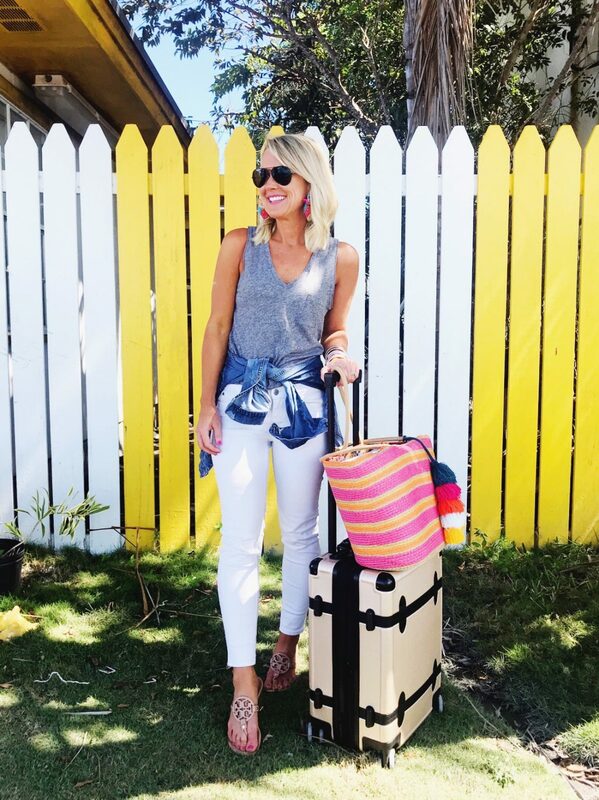 Great post and I love your vacation looks! I usually overpack with great intentions of looking “cute” , but almost always end up in my suit and board shorts the whole time. I think it goes back to this “saving it for good” idea—especially if I don’t know what we’re going to do after the beach or boat…..Do you ever suffer from this? What color is your hat from Amazon? There are several that look close, so hard to tell on the internet. Thanks!! Hi Janis! Mine is the khaki-A! Cassie, I am looking forward to the Trip Report! Waiting for all of your great tips. Can you share your trip report for this trip and NYC with a teen?..